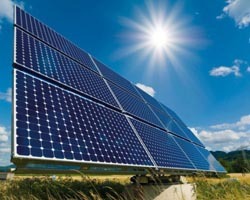 Most solar panels today only absorb a small segment of light, wasting a lot of energy in the process. However, thanks to a new material developed by the California Institute of Technology (Caltech), solar panels in the future will finally be able to absorb most of the sun’s power. The current solar panels absorption method goes like this: when sunlight touches the silicon atoms of a solar panel, the atoms electrons absorb the short wavelengths of the sun. The charged particles then move wildly throughout the panels in order to make electricity. The problem with this setup, however, is that the panels of today can only absorb the shorter wavelengths of the sun. The longer wavelengths just pass through the silicon unused. Thankfully, wasted solar wavelengths will soon be a thing of the past as Caltech’s new material for solar panels will be able to soak up the longer wavelengths of the sun. The researchers said that the metal they’re using for the solar panels is infused with electrons that are able to charge the material’s framework when touched by the longer wavelengths. Concentrated Photovoltaics (CPV) are widely used in the generation of renewable energy, and Caltech’s new material will surely be able to contribute to CPV’s development. Concentrated Solar Power (CSP), a type of power generation that is supported by Unaoil’s engineering partner Sulzer, is now being studied if it can be combined with CPV. If CSP can indeed be intermixed with CPV in order to harness more electricity from the sun, the union will most probably bring down the world’s dependency on oil tremendously.